The Hornby Class 110 was originally a Margate production, and although it had a make over in China, it remains very much 'first generation'. The design of the bogies is on the one hand very clever; and on the other, the Achilles Heal of the set-up. 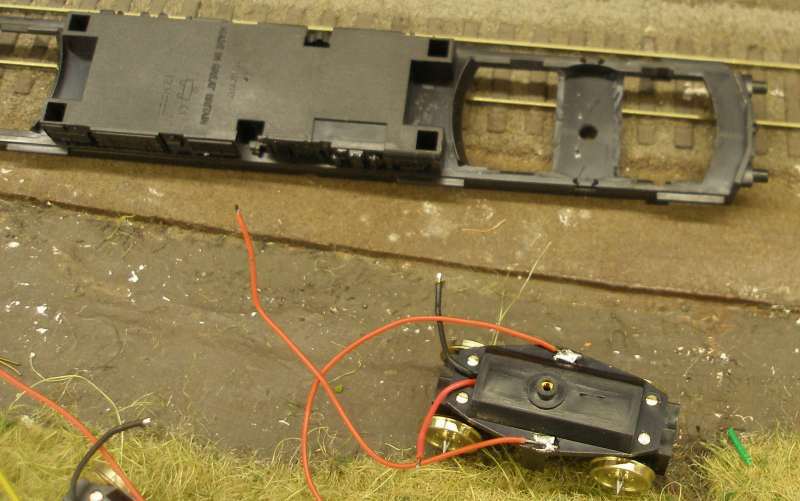 Hornby designed a single bogie frame that could be used in three ways: as a power bogie; in current collecting mode for the power car; and as a regular bogie under the two trailers. They all fit into a cavity or pocket in the underframe, and are held in by two clips fore-and-aft that allow them to be easily dropped out. The downside was that the design has high rotational friction in the pocket, as well as restricted side-to-side movement (so don't rock easily), and therefore both the power car and the trailers are prone to derailment. This can be reduced by careful filing of the guides, and also by upgrading the wheel sets. In this respect, although Lima used a similar design, both their power bogies and the trailer bogies are very free running and trouble free. Ironically, the Hornby bogie moulding is the better of the two, but you can't have everything. 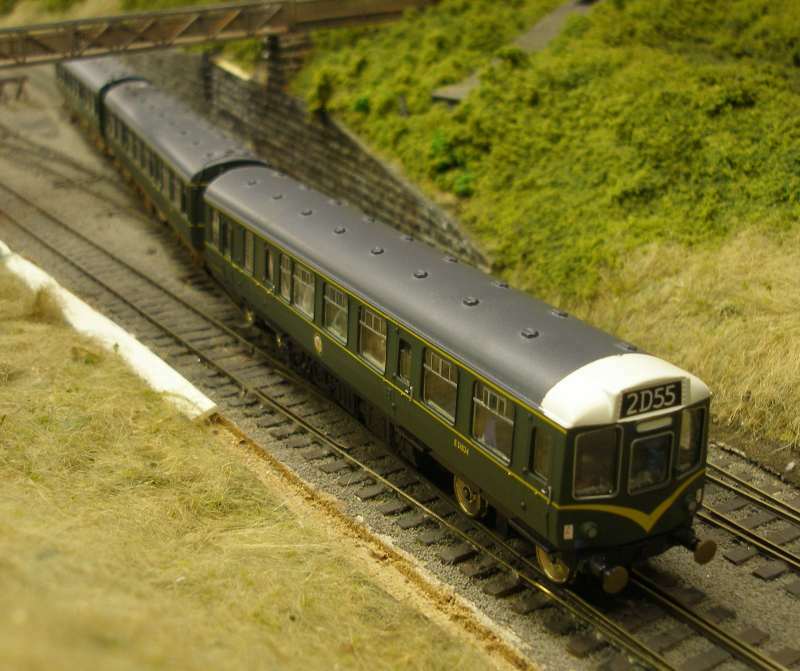 There are three 3-car Class 110 sets on Hall Royd: the first was upgraded using the Hornby Class 101 version of the Lima model, with the improved motor unit and wheel profiles. This was a very simple and very successful upgrade. The second set has retained its Hornby motor unit, but upgraded with Ultascale wheels, and the trailer bogies swapped out for Lima equivalents. The third set was the later Hornby China version, and initially retained the original wheels and traction tyres. It initially worked quite well, but after not being used for a few months, it was derailing with great regularity, and the traction tyres appeared to have lost their grip. A number of options were considered for this. An Ultrascale wheel upgrade was a distinct possibility, but reports of lengthened delivery times were a consideration. However, at circa £20 it was within budget. Option 2 was to try one of the Replica powered chassis. This looked an attractive option at circa £56, and offered two powered bogies and a metal frame. The only downside was that the chassis came up just below the windoes, so fitting the seats could be a problem. It was whilst considering the benefits of 8-wheel drive that I remembered that many years ago, as part of a project to assemble a series of DC Kit DMUs, I had bought two sets of Black Beetle bogies. These were dug out, and looked perfect for the upgrade as they featured a low profile that would fit the existing chassis without intruding into the passenger compartment, and also featured RP-25 wheels. The photo below shows the completed chassis and the much improved wheel profile is immediately obvious. The original Hornby chassis had been converted to DCC but the pancake motor takes up quite a lot of room, and its a pretty tight fit inside the brake van, which can also restrict bogie rotation.. I needed a new body for anther project, and it shipped with a spare underframe. This was ideal to convert, preserving the original in case of major error. It was possible to shave of the sides of the frame stretcher to allow the Black Beetle to sit flush against it at approximately the correct ride height. 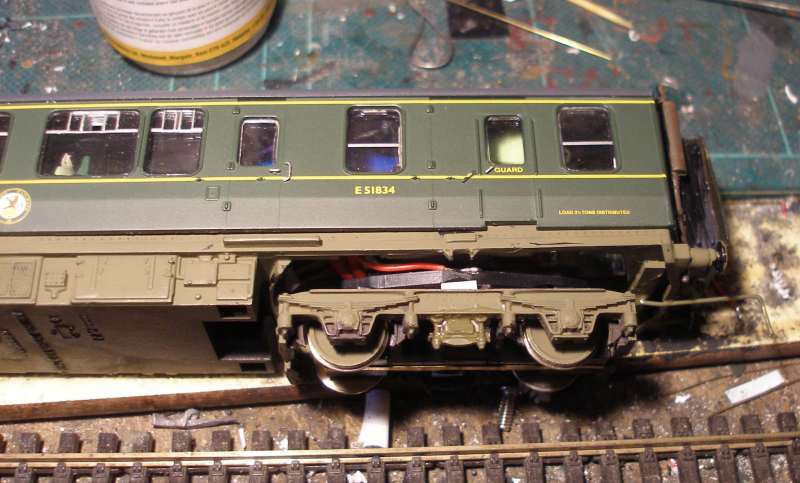 Note how the new pick-up wires have been fitted to the bogie. A new stretcher was cut from plasticard and cemented across the motor bogie pocket. This had two layers, the higher one have a larger hole drilled in it to accommodate the fixing screw on the top of the bogie. The ride height needed slight adjustment, although it was discovered that the Hornby chassis (left) rode slightly too high anyway. This whole process had taken less than an hour, and now with the Gaugemaster socket soldered in place and the original decoder plugged in, some road trials could be run. Although not shown, additional weight was glued into the roof space. There is a note with the Black Beetle not to overload the chassis, and enough lead was added to ensure adequate traction. With the road trials successfully completed, the next step was to add the bogie side frames. The Black Beetle features two plastic strips between the wheels to which the side frames can be attached. These had to be built out using strips of plasticard, as shown. 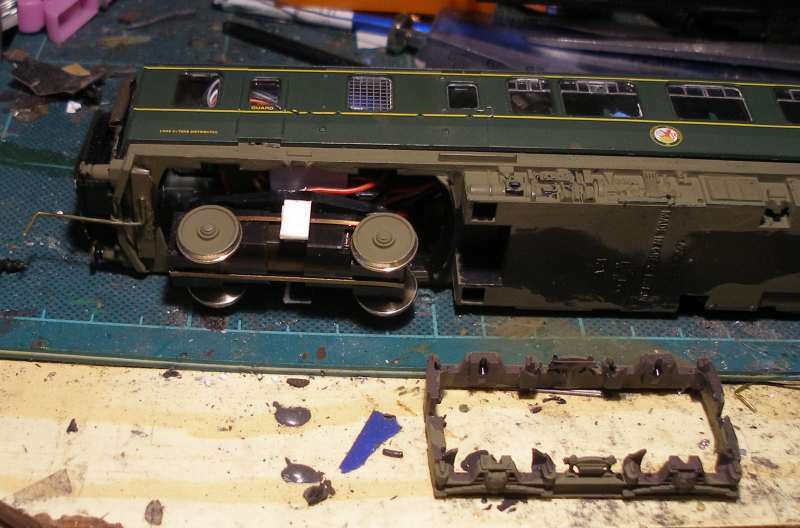 The Hornby frame was reduced so that only the side frames and stretchers were left as a single unit. And now with the frame assembly fitted. I found it best to secure one side and let it fully cure and then do the other side. Note how the side frame is fractionally longer than the Black Beetle wheel base. With the frames attached, it was back to the layout for further trials. The buffers were recovered from the original chassis. Finally, a shot showing the Class 110 fleet in the dedicated DMU storage sidings. The BR blue unit clearly shows the need for an urgent solution to the buffer problem. The model now benefits from having four powered axles and pick-ups on all wheels. The original seating fits back into the body without any modification: a big plus. 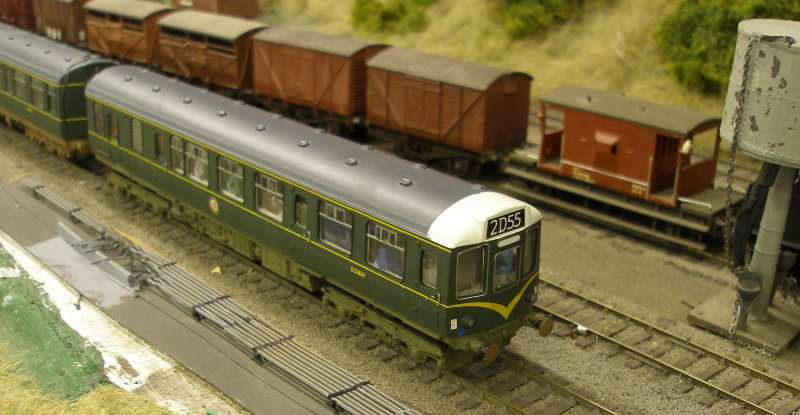 In terms of smoothness, it is no better than the original Hornby motored model, and in this regard the 4-axled Heljan Class 128 remains in a class of its own. However, the big downside is the cost of the units in pre-Brexit Britain. I was shocked to learn that new units (they come in powered and unpowered pairs) now cost £80 a pop, so the cost of this conversion would be £160 (I'm pretty certain I paid something like £25 each 10 years ago). So if doing this conversion from scratch, I would almost certainly use the Replica chassis, which at £56 is a third of the cost, comes ready assembled and provides all-wheel drive.